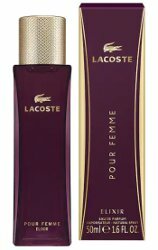 Lacoste has launched Lacoste Pour Femme Elixir, a new flanker to 2003's Lacoste Pour Femme. Lacoste Pour Femme Elixir follows 2017's Lacoste Pour Femme Légère and 2018's Lacoste Pour Femme Intense. Elegant and sophisticated, the Lacoste Pour Femme Elixir Eau de Parfum encapsulates the spirit of freedom; just as the polo shirt sparked greater freedom on the court, and shortened pleated tennis skirts gave women a sense of movement and liberation. Designed and tailor-made for the confident woman, the sensual scent opens with juicy Mandarin, spicy Pink Peppercorn and fresh Jasmine petals, before developing into a floral bouquet of Brazilian Gardenia and powdery purple Heliotrope. Tuberose and Cedarwood are enhanced by Vetiver and a hint of creamy Vanilla for an intense finish. Housed in an elegant bottle with the brand's signature crocodile logo. Additional notes for the floriental fragrance include ambrox and patchouli. Lacoste Pour Femme Elixir is available in 30, 50 and 90 ml Eau de Parfum.